We have completed % of our goal to enable us to flood the earth with the Book of Mormon through 2021. Book of Mormon Central is a non-profit, public charity that helps people all over the world build enduring faith in Jesus Christ by making the Book of Mormon accessible, comprehensible, and defensible. We are supported by people like you and appreciate all donations, large or small. 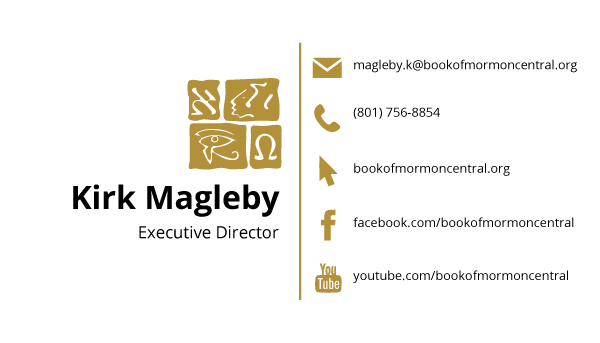 If you love the Book of Mormon, consider donating to Book of Mormon Central and becoming part of this exciting movement. Why Should You Donate to Book of Mormon Central? Hear Church leaders talk about the Book of Mormon, and the importance of supporting organizations such as Book of Mormon Central. Hear inspiring words from President Russell M. Nelson, Elder Jeffrey R. Holland, Elder Kevin W. Pearson, Chad H. Webb, and President Ezra Taft Benson. Lynne Wilson explains how tough questions from her institute students inspired her to develop a resource to centralize answers to Book of Mormon questions. How do I donate to Book of Mormon Central? Donate via Check. Make check payable to “Book of Mormon Central” and mail to P.O. Box 1538, American Fork, UT 84003-6538. Wire funds to our Bank of American Fork account. Contact Kirk Magleby for specific instructions. We are set up to receive gifts of stocks, bonds, real estate, etc. Contact Kirk Magleby to discuss your proposal. Book of Mormon Central operates with very low overhead. All officers and directors are volunteers. Thank you.